CMSE has launched a collaboration with Roxbury Community College and with Bunker Hill Community College, both local minority-rich two-year colleges, to engage the participants in current materials research. 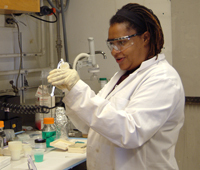 The primary goal of this program is to encourage a significant number of community college undergraduates to pursue careers in science and engineering. Students spend ten weeks during the summer working on CMSE research as part of a faculty-led research group, similar to our REU summer internship program. The CCP students participate in all REU meetings and activities. In addition, three separate meetings of these students with the MRSEC director and staff are devoted to addressing their concerns about research, seeing that they are comfortably assimilated into their research groups, and getting feedback on the program. At the conclusion of the summer, the students present posters on their research at a summer programs poster session, attended by the MIT community. Faculty at these colleges take primary responsibility for the selection of students for this program, who are chosen on the basis of their interest, academic preparation, and faculty recommendation. The RCC students choose their research projects from several presented by the MRSEC director during a preliminary seminar. The students are awarded a stipend for the summer.